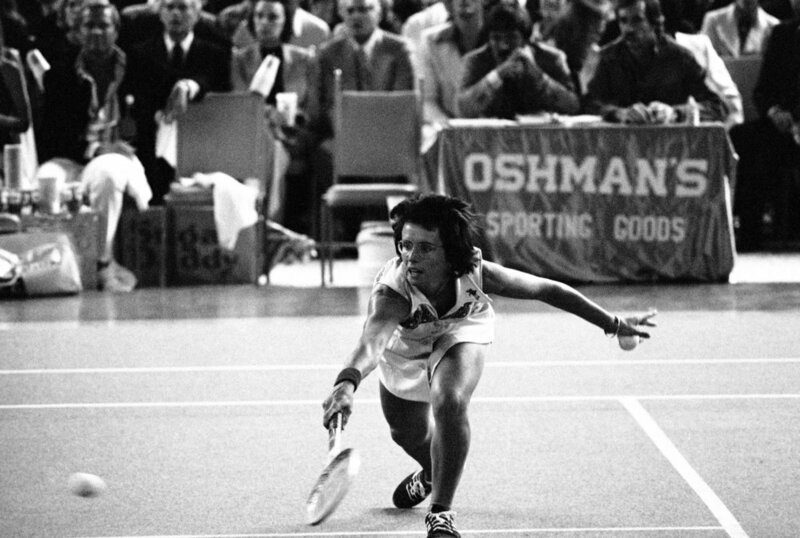 Tennis star Billie Jean King didn't just win a shitload of titles for herself, she changed the sport of tennis forever, tirelessly working to create equality for women in a world that just wasn't having it. It was no easy thing. Women athletes earned a teeny fraction of the prize money that their male counterparts did, and that's when they could find an event to compete in. King personally lost 2 million in sponsorships overnight after coming out (and being the first prominent female athlete to do so). And despite 9 Grand Slam titles under her belt by 1973, the world had the balls to keep making her prove herself. That was the year King agreed to play Bobby Riggs in an exhibition match dubbed "The Battle of the Sexes." Known for his chauvinist attitude (so charming), the event was more stunt than substance, on the surface. "To beat a 55-year-old guy was no thrill for me," said King. "The thrill was exposing a lot of new people to tennis." Could a woman beat a man in a tennis match? Fifty million Americans wondered as much when they tuned in to watch 29-year-old underdog King take on Riggs. "I thought it would set us back 50 years if I didn't win that match. It would ruin the women's [tennis] tour and affect all women's self-esteem." So this boss lady did what she had to. King defeated Riggs 6-4; 6-3; 6-3. It was a humiliating defeat for Riggs and a big win for women's tennis: the event is looked at as a turning point in the way women were respected and recognized in the sport. While King is often remembered for this one match, she was also an outspoken advocate for the enactment of Title IX, started the first woman-run tennis tour and won Wimbledon 20 freaking times. Make sure to read about all of her many, many accomplishments. A tennis hero, an equality hero, and a true pioneer in sports. We heart you, Billie Jean!